Muzzammil Khan, a chest specialist, runs “health camps” for poor people several times a month around Lucknow, Uttar Pradesh. At one such event I attended in 2013 sales representatives and technicians from four Indian drug companies (Elder Pharmaceuticals, Ipca Laboratories, Biocon, and Lupin) screened Khan's patients for heart problems, lung disease, diabetes, and other conditions. “Without the companies, I wouldn't be able to do all this,” Khan said. The drug makers had brought an electrocardiograph, a spirometer, a bone density scanner, and a glucose meter to the camp. Afterwards, an invoice of sorts was lying on the floor. 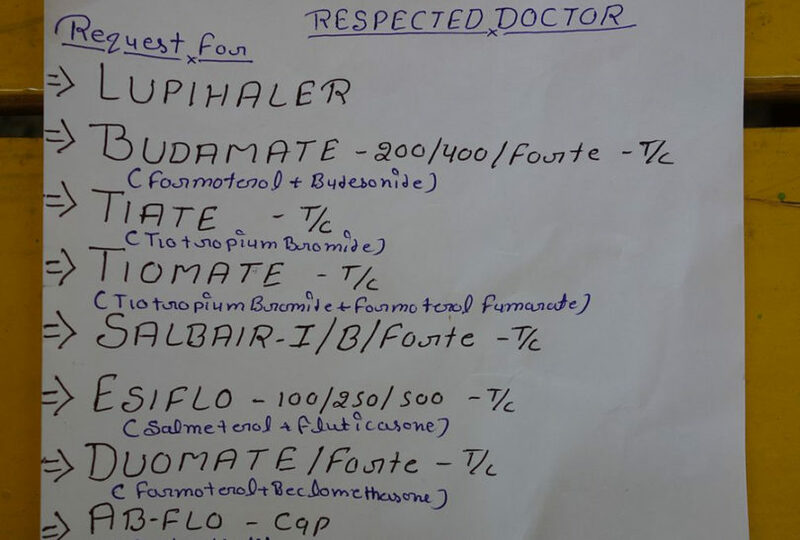 “Respected doctor,” it began, followed by a “request” to prescribe 13 drugs made by Lupin. “It's a little bit of, 'You scratch my back, I scratch yours,'” explained Khan, who today has agreements with about a dozen drug companies that perform medical tests for him. At the camp in 2013, Syed Raza, a technician and Ipca sales representative who regularly helps at Khan's camps, did electrocardiography on about a third of the visitors. Raza told me that his services benefit patients and help him achieve his sales targets. Satish Yadav, a Biocon representative also at Khan's camp, did blood sugar tests on dozens of patients. “If we make good relations with the doctors, then we will get business,” he said. Doing health camps is “the best way to please the doctor,” Sumahan Chakraborty, a veteran representative for Elder, told The BMJ. The regulatory body the Medical Council of India (MCI) says that the practice is unauthorised, however. “Screening and diagnostic tests . . . can be performed only by [a] registered medical practitioner,” Jayshree Mehta, the MCI's president, told The BMJ, regardless of whether the test is invasive. Likewise, for doctors to prescribe specific products in return for testing services from a drug company is not only “totally unethical,” said K L Sharma, joint secretary at the Ministry of Health and Family Welfare; it also violates MCI regulations. Free health camps have grown popular with many people in India who lack access to affordable medical care; specific events are held for slum dwellers2, transgender people3, and auto rickshaw drivers.4 Some target just one disease; others provide general care. For larger health camps companies typically work with civil society organizations. The events are highly publicised to local residents and may include medical testing by drug representatives or technicians. They often take place at temples or schools near slum areas and attract hundreds of visitors. Smaller “patient camps” are much more common. Representatives may spend a day doing tests at a hospital or in the waiting room of a doctor's office (see sidebar, “A Readymade Prescription”). Insiders say that local competition soon followed multinational involvement. “Everybody is doing it now,” said Sarfaraj Majid, a diabetes specialist at B P Poddar Hospital in Kolkata who hosts a couple of health camps every month with reps from several global firms. “If I don't prescribe their brand, they will not be able to come,” Majid told The BMJ. The BMJ has evidence that unlicensed employees from several Indian drug firms and from the Indian arms of Abbott, Bayer, GlaxoSmithKline, Roche, and Sanofi have tested patients at health camps. Ransom D'Souza, a GlaxoSmithKline India spokesperson, said, “Our sales representatives are not permitted to perform tests on patients in India,” although the company does provide glucose meters to healthcare professionals and has “supported uric acid testing through a specialist diagnostic third party.” He added that GSK “at no point in time” has “sought prescriptions from [healthcare professionals] in reciprocation” and that last year the company removed individual sales targets for its representatives. Pinaki Dutt, a GSK sales rep from Bankura, West Bengal, told me in 2013 that he and his colleagues were required by “company policy” to do blood sugar tests at regular health camps. The unchecked screening and conflicts of interest have experts worried. “This kind of behaviour can actually lead to harm to patients — overdiagnosis, misclassification [of healthy people as sick], iatrogenic harm of drugs,” Glyn Elwyn, a primary care clinician-researcher at the Dartmouth Center for Health Care Delivery Science in New Hampshire, USA, told The BMJ. Balram Bhargava, a cardiologist at the All India Institute of Medical Sciences in New Delhi, told The BMJ that patients often come to him with huge files of test results and ask to have any abnormal or borderline finding corrected. “They are not worried about themselves, they have no [health] complaints, but they want the test to be set right,” said Bhargava, who founded the Society for Less Investigative Medicine last year to help curb excess testing and screening. That year alone, the company says it screened more than 240 000 people for thyroid disorders.7 Meanwhile, sales of its flagship product Thyronorm, a branded version of thyroxine, raced ahead of cheaper competitors in India (see sidebar, “Award-Winning Market Creation”). Today, Thyronorm is among the top 10 drugs in India,8 grossing almost $3.5m (£2.3m; €3.3.m; Rs230m) a month, according to research firm IMS Health. Using a cheaper brand could save millions of dollars a year. ”I would call it market penetration with a label of corporate social responsibility,“ said Hans Hogerzeil, a professor of global health at Groningen University in the Netherlands and until 2011 director for essential medicines and pharmaceutical policies at the World Health Organization. It is not clear how the industry decides which diseases to target in its screening programmes. WHO offers little advice on screening for non-communicable diseases, and in several cases the scientific evidence remains inconclusive. For example, no trials have directly tested the benefits and harms of screening for thyroid dysfunction,14 and guidelines are split on the question. An Abbott rep who does screening at diabetes camps told The BMJ that his services are an investment in the doctor and have nothing to do with charity. ”The only objective is the business transaction,“ said the rep, who spoke on condition of anonymity from fear of losing his job. According to a drug compendium from healthcare media company CIMS, Abbott sells 37 diabetes drugs in India. Most are fixed dose combinations, several of which have not been approved in the UK or US15 but are popular among Indian doctors. For example, sales of Tribet (glimepiride, pioglitazone, and metformin) exceeded Rs485.5m in 2012, making it the top brand among 68 in India, according to data from PharmaTrac, a commercial database. Several industry insiders confirmed that one positive test result is usually enough to trigger a prescription. That's going to harm a lot of people, according to Pankaj Shah, a diabetes specialist who worked at All India Institute of Medical Sciences in New Delhi before joining the Mayo Clinic in the United States. Even if screening for diabetes is done properly, up to half of tests that initially come up positive can be false alarms, he explained. So many people may end up taking drugs for a disease that they don't have, risking side effects without benefit. ”I would call it outright malpractice,“ Shah said. Other doctors, such as M K Mukhopadhyay in Kolkata, charge patients for the tests. When I visited his diabetes clinic in 2013, a man who said he was a technician from the drug company Sanofi was doing finger prick tests in the crowded waiting room, an Abbott rep stood by the bathroom with a urine dipstick kit, and a technician from Thyrocare, an Indian diagnostics company, was drawing blood in the hallway as part of Abbott's Friday Thyroid Clinic programme. One of Mukhopadhyay's patients said that he had just paid the doctor Rs1700 for various tests and was surprised to learn they were being done by drug companies. Another frail retired patient paid Rs2100 for tests done by Abbott and Sanofi. ”It is difficult to pay because the treatment is high cost, the medicine is high cost, the doctor's fee is high cost,“ he told me. Many others in India face similar problems. At a health camp for lung disease run by a non-governmental organization, 75 year old Malati Singh was diagnosed with chronic obstructive pulmonary disease (COPD) and given a prescription for five drugs, four of which were made by Cipla, the company doing spirometry tests at the camp. WHO discourages use of two of the drugs, both from Cipla, in COPD because of side effects and small benefit. Singh wasn't happy — not because she was aware of WHO's warnings — but because she knew that her husband, a teashop worker, wouldn't be able to afford the drugs. ”My husband says, 'It is better you die,'“ she said. Charlotte Chunawala, a Cipla spokesperson, told The BMJ that the company sends technicians to screen patients for asthma and COPD at health camps with the ”full consent of the treating physician.“ But Cipla ”exerts no influence on the prescription of products and has no direct contact with patients“ the spokesperson said. For Leena Menghaney, a lawyer and India manager of Médecins Sans Frontières' Access Campaign, Singh's story illustrates the problem with many health camps. ”This is nothing but selling privatised health care, whether it's medicines or diagnostics,“ Menghaney said, adding that she discourages her family from going to the camps. Until last year, doing free blood tests for diabetes was part of the job description for Kolkata based Aiswaryya Mukherjee. He is not a health professional but a sales representative for Bayer Zydus Pharma, a joint venture between German company Bayer HealthCare and Indian Zydus Cadila. Mukherjee explained to The BMJ that before his company abruptly ended its health camps last year he would spend two to four days a month testing haemoglobin A1c at diabetes clinics. Many patients were already receiving treatment for the disease; the point was to get the doctor to switch them to Bayer Zydus's products, Mukherjee explained. He said that a ”gentlemen's agreement“ with the doctor ensured ”a readymade prescription“ for the drug he was promoting in return for his services. ”In most of the clinics, when the camps are going on, only the prick test is done,“ said Mukherjee, who has been a representative for 20 years, working for Bayer India before the joint venture with Zydus Cadila. He said that lifestyle modification was never discussed. When contacted by The BMJ, Bayer Zydus said that it was ”looking into the matter“ but did not provide further comment. This article was reported with support from the H.D. Lloyd Fund for Investigative Journalism at The Nation Institute. 1. Indian Medical Council. Code of ethics regulations, 2002. www.mciindia.org/ RulesandRegulations/CodeofMedicalEthicsRegulations2002.aspx. 2. Free health camps for slum dwellers by Art of Living. Business Standard 2013 May 10. www.business-standard.com/article/news-ians/free-health-camps-for-slum-dwellers-by- art-of-living-113051000649_1.html. 3. Health camp for MSM & trangenders held. Sangai Express 2015. www.thesangaiexpress. com/page/items/49099/health-camp-for-msm-trangenders-held. 4. Free health check up camp for auto rickshaw drivers in Navi Mumbai. 2015. http://www. iamin.in/en/thane/news/free-health-check-camp-auto-rickshaw-drivers-navi-mumbai- 56921. 5. Varma S. How Indians spend their money. Times of India 2014 Jul 13. http://timesofindia. indiatimes.com/home/sunday-times/deep-focus/How-Indians-spend-their-money/ articleshow/38289537.cms. 6. Abbott India. Citizenship report 2010-2011. http://prod2.dam.abbott.com/global/documents/ pdfs/abbott-citizenship/country-reports/2010-11-india-citizenship-report.pdf. 7. Abbott India. Transforming lives through a continuum of care: annual report 2011. www. abbott.co.in/pdf/investor-relations/annual-reports/AnnualReport2011.pdf. 9. Abbott India. Annual report 2010. www.abbott-laboratories.si/uploads/datoteke/Global% 20citizenship%20report%202010.pdf. 10. Abbott India. Your experience, our promise: annual report 2013-14. http://www.abbott.co. in/pdf/investor-relations/annual-reports/AnnualReport2013.pdf. 11. Abbott India. Annual report 2014-15. http://www.abbott.co.in/pdf/investor-relations/annual- reports/ABOTT_ANNUAL_REPORT_14-15.pdf. 13. Abbot India. Corporate social responsibility policy. www.abbott.co.in/pdf/investor-relations/ pdfs/Corporate_Social_Responsibility_Policy.pdf. 14. Rugge JB, Bougatsos C, Chou R. Screening and treatment of thyroid dysfunction: an evidence review for the US Preventive Services Task Force. Ann Intern Med 2015;162:35-45. 15. McGettigan P, Roderick P, Mahajan R, Kadam A, Pollock AM. Use of fixed dose combination (FDC) drugs in India: central regulatory approval and sales of FDCs containing non-steroidal anti-inflammatory drugs (NSAIDs), metformin, or psychotropic drugs. PLoS Med 2015;12:e1001826. 16. English E, Idris I, Smith G, Dhatariya K, Kilpatrick ES, John WG. The effect of anaemia and abnormalities of erythrocyte indices on HbA1c analysis: a systematic review. Diabetologia 2015;58:1409-21. Frederik Joelving is a journalist focusing on health, pharma and investigative reporting.